*Top billing on all social media, BRAWS website & email communications re: the Run. *One social media post dedicated solely to your business/organization with at least two further posts listing your business/organization and other sponsors. *Name and Logo on event t shirt to be handed out to the first 75 participants to sign up. *Vendor table at the event to be supplied by BRAWS. *Can supply promotional materials in swag bag handed out to all attendees at the event. *Acknowledgement on BRAWS website and social media. *Name and logo, along with BRAWS logo on Swag Bags to be handed out to all participants. *Vendor table at event supplied by Sponsor. 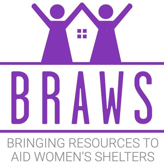 *Name and logo, along with BRAWS logo on giveaway item to be mutually agreed on by sponsor and BRAWS (ex: reflective bracelets or caribiners) and handed out to 100 participants. *Acknowledgement on BRAWS website and social media, listing your business/organization and other sponsors. *Sponsor will lead 10 minute warm up before the run for participants. *Sponsor will supply water cooler and cups at race turnaround on trail. *Signage (8X10) at Water Station thanking sponsor with name and logo. *Signage (8x10) at the Mile Mark (0.5, 1, 1.5) thanking Sponsor with Sponsor’s name and Logo.